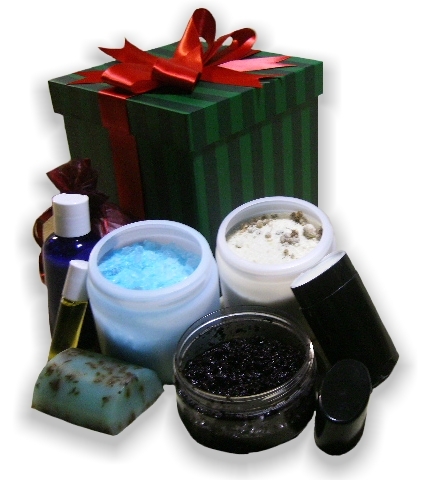 This “Holiday Cheer” gift basket contains the following handmade “inspirations” to keep you smelling like a rose no matter how many sewer runs you’ve made. Respite: Known for it’s healing properties, Tea Tree Oil is a great anti-bacterial oil and is paired with Oregano in this bath bar to restore lost hit points to your hands and/or body! Catch a Breath: Need to recoup after that MoSTF or the Hami Raid that wouldn’t end? Draw a bath and ease into the rejuvenating properties of this unique salt soak. Peppermint & eucalyptus work together to enliven your senses as you take a moment to catch your breath! Luck: Need a boost to your defenses? Like, defenses against odor? This refreshing deodorant stick is just the thing, featuring a proprietary healing blend! Enrage: Nothing says “rage” quite like a fizzing bath! Ginger, cinnamon, and nutmeg add just the right spice to your life! Insight: Let us rejoin the mind to the body…relax in a milk bath scented with lavender and vanilla and decorated with dried chamomile flowers. Awaken: Resurrect yourself with this coffee scrub–caffeine always works to spruce up your mind and body! Break Free: Break free from the immobilizing effects of a migraine with this blend of oils known to calm throbbing headaches. Sturdy: This lotion helps defend against nail peeling and dry skin, refreshing you with a light citrus scent! To bid on this item, place a comment below with the amount of your bid. Use a valid email address so that you can be contacted if you are the winning bid. Don’t forget the rules regarding payment for winning bids! Bidding ends tonight at Midnight Eastern Time (9:00pm Pacific)! IMPORTANT NOTE: Winning bidders please wait for email instructions from Real World Hero on how to pay for the item(s) you have won. Next post: Auction Update: Sold, to the Hero in the Blue Spandex!